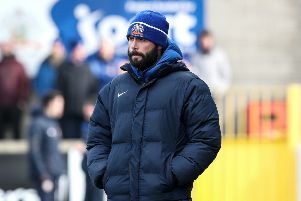 It was a frustrating day for Coleraine boss Rodney McAree as he watched his new charges held to a goalless draw by Ards. The Bannsiders dominated large parts of the game and created the better chances, but they failed to break down a dogged Ards team who defended for their lives. Speaking after the game McAree felt his side had done enough to win the game. “It was a frustrating afternoon as I believe over the 90 minutes, we’ve done enough to win the game,” he said. “We’ve created enough half and clear cut chances and on another day we score two and three, and run out easy enough winners. “Ards set themselves up to be hard to break down and they were very well drilled. McAree watched on from the stands and said there wasn’t too much he would have changed on the day. “I don’t think there’s too much wrong with the structures that are in place,” he said. “The guys who were in charge are extremely experienced and very good at their job. “The decisions that they made today are ones that I would probably have made myself. “You probably want to reach the standard of the second-half a bit quicker, probably hoping to start the game on the front foot and play to the energy and tempo that we did in the second-half. “I think if we can get to that level that little bit sooner then you give yourself more opportunities of winning. “Coleraine are a team that has aspirations to win the league and we’re not, so you have to take your hat off to the players,” he said. “They worked extremely hard and were well worth a point today. “The boys were putting their bodies on the line right up until the full time whistle, but that’s the way we’ve been this season. “We’ve played well in every game so far this season, but we just haven’t the points to show for it. “That’s the ruthlessness of this league though, it’s a very tough league. “But I’m really, really proud of the boys today, they have put in a great shift. “We have worked hard all week in preparation of the game. The team played so well but former defender Nixon was delighted with the performance of his rearguard. Keeper Sam Johnston produced another excellent performance with a point blank save from Stevie Lowry the highlight. “The whole back five have been outstanding in the last two games,” said Nixon. “Sam has been brilliant and that has given us a good platform, which maybe we haven’t had in recent years."